This article was first published via THUMP on March 18, 2016. Young adulthood after uni is a strange time. Mostly, that's in the form of subtle (and not so subtle nudges) to settle down and answer the big question: What do you want to be when you grow up? Melbourne–based musician, Simon Lam, is another twenty-something who's in this exact position. "There's probably never a day where I don't question everything that I'm doing," he says. After studying (then escaping) a jazz degree straight after high school, Lam's done a myriad of musical projects that has seen him jet off around the world and hack at the "full time artist thing" for most of his life. As such, he has attained a kind of mini-wunderkind status in Melbourne's tight-knit music scene. At 19, he moved to London playing for Kins. At jazz school a few years later he met Hamish Mitchell and Dan Rutman, giving us I'lls. Now, he's playing for Kllo and Couture, and in April, we're getting his debut solo EP, Tin,under the moniker Nearly Oratorio. So, for all intents and purpose, Lam's CV echoes the lingering existential questions niggling at the back some millennials: When we do grow up, how do we find purpose and make it work? "I'm definitely fearful of my lifestyle in that it's quite different to the average person," he said. "It's weird. Being a 'full time artist' is something that I've really had to force myself to do." Tin comes at a time where, in a sense, Simon's ticked off the big adult, 'to-dos'. He's working out of a studio in Melbourne's CBD for the first time this year (one which belonged to visual artist, Ghostpatrol). He's getting regular sound engineering work, and the whole 'making your art pay' thing seems to be coming into its own. But the EP isn't a snapshot of this. Instead, Simon considers this debut a work created from the gaps within Simon's other projects. "A lot of the Nearly stuff is really low-key, and a lot of the time I made it after doing sessions with Chloe [Kaul] or for I'lls. After doing a day of electronic music, this stuff's really nice to do when everybody goes home so I can just make something really quiet," he said. 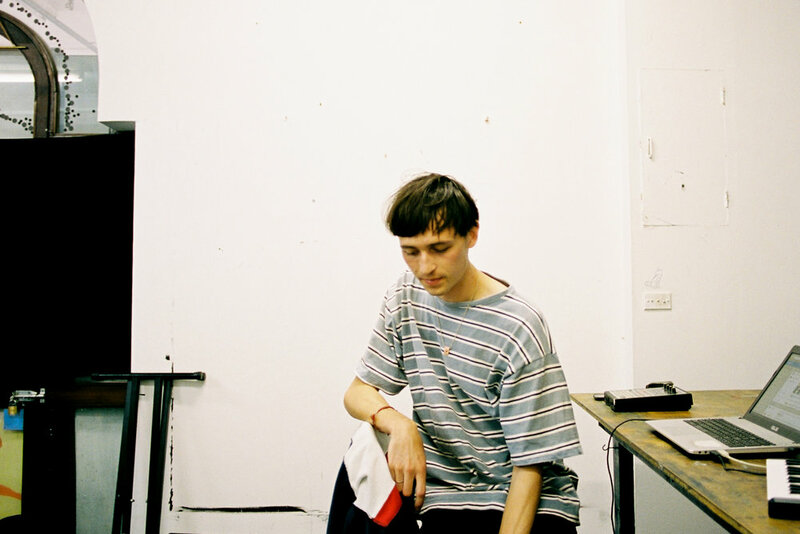 Tin appears to be an antidote to Simon's self-professed desire to "make things have a point, quickly" on Kllo's tracks. Instead, its sonic landscape is swarming with delicate sentiments, at times swarming with a landscape, quite literally. Its last track, 'Devonport', closes with birds cooing out a window. "It's funny because I only realised really late that all of those birds were in the recording, and I just kind of shrugged," he said. "It's just funny that I decided to leave those birds in, because when I recorded vocals for Chloe in the spring, there was this one bird around my studio and I just had to spend hours editing this bird out." The work that Simon does for Kllo is highly strung. Burrowing into Ableton and sequencing a litany of micro-beats for hours at a time, which then gets sent to multiple labels, will probably do that to you. Tin is something that runs away from this, in a sense, like how Simon just messed around with a tin whistle for the EP's title track. Thematically, Simon pits some of the tracks as "straight breakup songs", which he apologetically said were "really soppy and really lame". The thing is: he's not changing anything. "A lot of them are quite personal, and I'm just not afraid anymore," he said. This is actually quite telling. For a man whose built quite a reputation playing in acts renowned for being tight, sharp, and critically on point, understandably Simon's regularly got a lot on his mind. "I just never stop thinking about the future I guess," he said. "I'm pretty anxious in that sense, but at the same time I'm a huge procrastinator, so it doesn't really go well. I just don't do anything about 'it' for a long time. I only tend to take action when the situation gets extreme." When the EP eventually does get released, you can probably imagine there are a litany of things it'll have to answer for from friends, family and critics alike. After, all, musicians have their whole life to write their debut, right? But don't expect anything too profound: Instead, consider this a stripped back teenage dream. "There's not really much I'm trying to get across as an artist. It's a very personal diary from myself, but broad enough for other people to incorporate it into their own lives," he said. "I think it's just fun for me because it feels like I'm sixteen again. I really miss those first moments where you write music when you're really naïve—it's the closest I'll ever have to a journal."